In case we’ve never met, allow me to introduce myself as a professional educator and 20+ year veteran homeschool parent. I homeschooled my kids all the way to college, and I remain a passionate advocate for home education and parental rights, working, writing, and, speaking to families coast to coast. 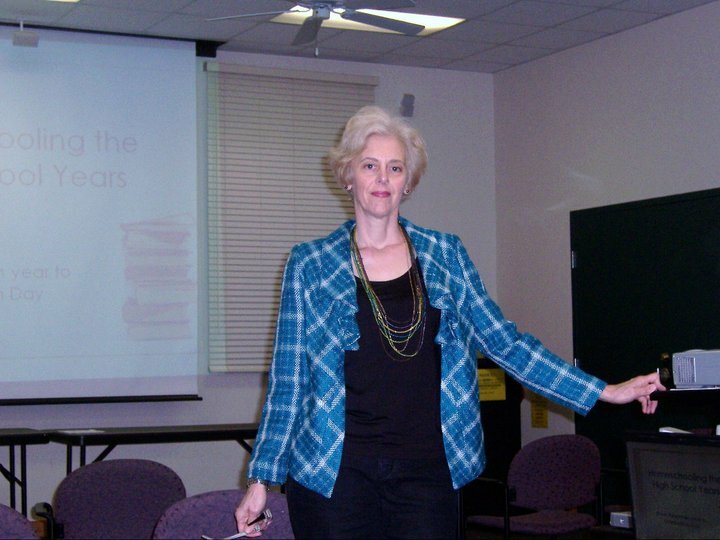 I was a college professor for many years, then certified as a school teacher some years later. I have probably spent time in every kind of classroom setting you can imagine. At one point, I even mentored new teachers, too. My classroom experiences, combined with research and my own instincts are what led me to chose home education for my own children. I eventually left traditional schoolrooms altogether. I couldn’t be part of that malfunctioning (read: harmful) system any more. I have never looked back on my decision not to send my children to traditional school. I encourage everyone who feels the same way to make the same decision I did. When I wrote the article “Why I Quit Teaching” in 2014, I never imagined the response it would get. I wrote it partly to vent my frustration and partly to explain to readers why I left (especially the parents of children in my classes who might be reading). But, mostly, I wrote it for all the other frustrated teachers, frustrated parents, frustrated administrators, and a generally frustrated public — people who might need to read it, people fed up with the state of traditional education, people wondering if they were the only ones thinking there was something terribly wrong. I wanted people who read my article to understand how difficult / tiring / thankless teaching really is, and how little good teachers can do anything about it. I wanted people who read my article to understand how hard I tried to make a difference, but how powerless I was, how powerless all teachers are, to do what our hearts originally called us to do. I wanted people who read the article to know there is something terribly wrong. Worse, that there isn’t anything they can do to change it. Since writing that post, I’ve received SO. MANY. EMAILS. More than I can count now. Some left comments under the article itself, but most write directly to my Inbox. I read the emails with chills, my eyes welling with tears of empathy and understanding. I write back with as much support as I can muster, as I too experienced many of those same feelings at one time, too. Though the article is now 2 years old, I continue receiving letters from frustrated teachers about once a week. I can only imagine how many other teachers think of writing to me, or writing to someone else, or speaking out about what they’re going through. I personally respond to as many as I can. Sometimes, the teachers and I correspond for a period of time. I try to create a container where these people can get their thoughts out. Because there really isn’t anything I can do, I can’t make recommendations for or about them. How could I? I don’t know any of these people or their situations. But, at least I feel I can provide a listening ear. So, I devote 30 minutes a week or so to replying to teachers who write to me about quitting. Had you any idea our nation’s teachers were suffering in this way? 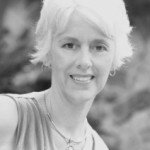 Were you aware how helpless, hopeless and misunderstood many teachers actually feel? In case you weren’t, I figured I’d let you know. Looking back now, I know that was one of the most important posts I ever wrote. You guys know I love homeschooling. You know I love introducing it to people who are anxious to get started. You know I speak to audiences about the advantages and benefits of graduating from a home education program. I just can’t say enough about it. Homeschooling is the bomb. Unless you ask me what I don’t like about it. Which I don’t mind sharing, either. Because I never want you going around thinking, “What a liar. She said it was gonna be easy, and now my kid’s failing Algebra 2” and things like that. It’s not fair for people to trick you into thinking homeschooling is all unicorns and rainbows. I need you to know it’s serious business, and it can be really, really hard. I should probably also tell you there might be days when you dream about the school bus and getting the house all to yourself. Sometimes, it can get so frustrating you even want to quit. In case you think I’m joking, I’ve made a list of the things I hate about homeschooling. Well, strongly dislike. These aren’t deal-breakers obviously, but things I could seriously do without. I’ve written this article so you’ll understand that when homeschooling (as with anything else), you learn to take the good with the bad. If this stuff bothers you a lot, they might be deal breakers for you. But, if you can look past them as I do, they don’t make a bit of difference compared to all the good you’re doing for your kids. You know those friends and family members who smile politely and ask all the obligatory questions? They really don’t want to hear your answers. Because they’ve already made up their minds that you’re either crazy, or wrecking your kids lives, or both. I try not to waste my time on hypocrisy or negativity. It’s hard to avoid though. Like those people who witness a meltdown in public (yours or your kids’) or who see your kids doing something sorta crazy or super-nerdy, and they can’t relate? They assume there is something terribly, terribly wrong because you’re not doing anything about it. Especially if you’re the kind of mom who doesn’t care about that kind of thing because you know your kids are fun and quirky and normal. So, you don’t even try to explain or change what’s happening, therefore they assume you’re really messed up. Over the last 20 or 30 years, there has always been somebody at home. And, when you leave the house, you’re usually all together. So, you personally never get any time in your own house, alone, to just do whatever in the heck you want, in your own house, because you can. I distinctly remember all the times this has actually happened in my house, by the way, which is exactly 2. Because I keep track. Just because we’re doing something that makes people curious doesn’t mean we totally have to drop everything we’re doing. Sometimes we have babies in our arms or it’s at the very second we were just about to make a dash to the restroom. But we can’t always avoid making eye contact with people, or we’re just trying to be polite, and now we have to spend all that time pretending to be nice and telling them everything they want to know. That. Because you really want to have friends, but when you’ve been homeschooling a while, you start getting the impression that people only love you for what you know. And everybody knows how frugal homeschoolers are, but you simply don’t have time for “quick questions” all the time. Besides, you don’t even like coffee that much, and it’s not worth getting a free cup if it’s going to take 2 precious hours out of your day and you’re not even going to feel refreshed afterwards. It’s just hard to figure out if you’re really friends or if people are just using you to get free information they’re too cheap to pay for from people who actually give that kind of advice for a living. You know, because somebody might ask you or your kids a question, or might notice your kid has a bruise on his arm from falling off his scooter and that person might be your pediatrician and you’re afraid he might report you for neglect. Or other people might notice you’re out during the day when all the other kids in town are “in school” and your kids are not. So, you can never truly relax 100% because there’s always that person who’ll think something or say something or spread something that makes homeschoolers look bad, and you feel responsible for making sure that doesn’t happen. They all take it. And there’s never any left. Even when I put my name on it and hide it aaaaallll the way in the back in the fridge. Because I’m the mom and they don’t care, and that’s the way the world goes ’round. And I’m not supposed to feel bad about it either. Okay, maybe this isn’t just about homeschooling. I know people travel on the cheap but the truth is, there’s just never anything extra in the budget (plus, we run a business so we need to be in one place). Which makes me sad, because my kids want to see things and places, and I feel like a big old failure when I can’t provide it. They don’t ask for much, so this is actually a tough one for me. I wish I could’ve figured this one out years ago. Everyone knows we’re supposed to work on our marriages and prioritize this very important thing. But, the problem is lack of time to even spend with our husbands (speaking to wives here), let alone read books or study things about marriage. I still manage to do it to some degree, but there’s definitely some frustration over doing it enough. Since you were capable of earning a decent income before kids, now you’re feeling like you can’t use your experience or your college degrees to significantly contribute to the family income. Especially when money is tight, and particularly when people ask if “you work” or what “you’re gonna do when the kids move out” and things like that. It’s a decision you made when you had kids, and you know you made the right choice, but there’s still that little feeling that you could be earning money, maybe even lots of it. So those are my homeschooling pet peeves. Perhaps you agree with some of them, or maybe those wouldn’t bother you at all. Thankfully, mine is a short list. Because, as I’ve said repeatedly, I love homeschooling my kids. 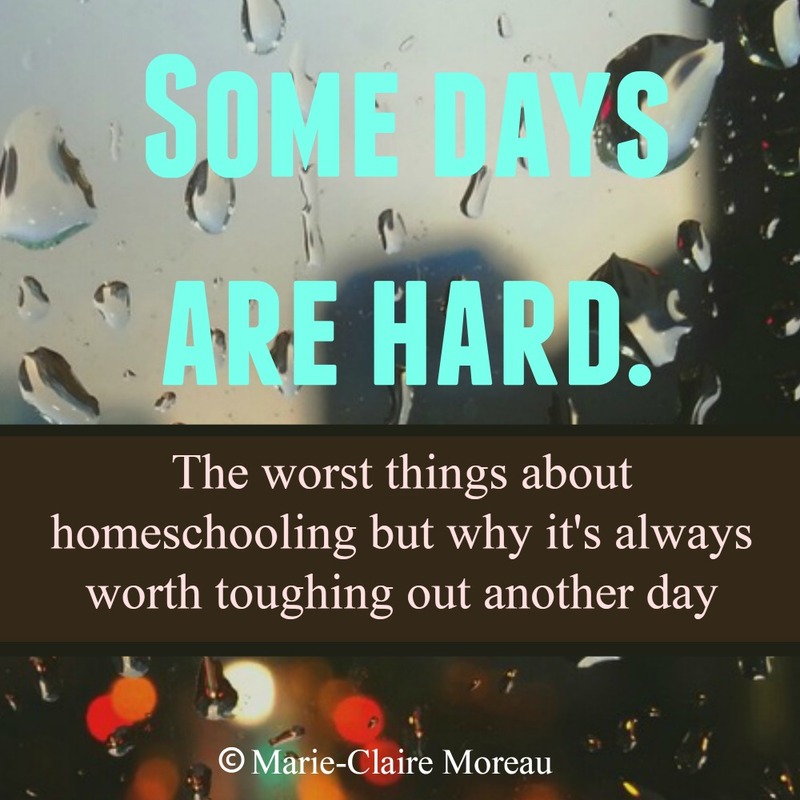 Is there something you hate about homeschooling? Post a COMMENT letting me know. I’d love to compare notes. Or, maybe it’ll end up in my next book. Ever catch yourself comparing your kids to somebody else’s kids? 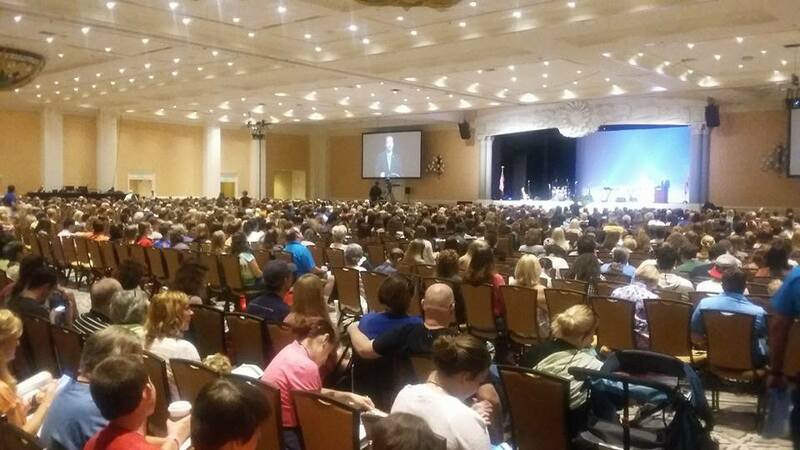 Ever compare your homeschool to someone else’s homeschool? I’m guessing we’ve all done this a little. I think it’s because we’re looking for reassurance and a sense of belonging. As parents, we like knowing we’re on the right track. We find comfort knowing we’re not so totally different that we should be worrying about it. Am I right? But, sometimes, comparisons can go too far. Maybe you know people who make it a habit of comparing themselves to others? Maybe — that person is you? Let me tell you what’s wrong with the comparison game. But, first, let me explain how it manifests in the homeschooling community (at least the way I’ve noticed it). The comparison game is played when one person starts watching another family, chatting with the other parent, and asking questions like, when-did-your-kid-do-this and how-does-your-kid-do-on-that. Questions usually center around quantity, timing and degree. At beginner levels, the first person takes mental notes on what she’s hearing and creates visuals in her mind of how her kids stack up. At this stage, it’s hardly visible to the other players (who might not even realize the game is going on). At more advanced levels, the first player starts sharing things about her kids do, too. Usually, she’ll share better things and bigger victories, mindful only to share when her kids’ performance exceed the levels she perceives on the playing field. This stage can be either one-sided or interactive, but always ends in making the other players feel bad. Reaching expert level in the comparison game doesn’t take long, just practice. Unfortunately, the price of doing it so well is having to homeschool alone, because other people won’t stick around for very long. It’s no fun being with “winners” in this game. They’re obnoxious and annoying. All they do it take from relationships, never offering help or support in return. Though I’ve painted an extreme picture, I think we can all relate to this story on some level. While some level of comparison might not be so bad, it’s those extreme levels that are unpleasant for us to be around. Which is a good thing, really. Because comparing children isn’t as helpful as one might think. You might actually want to rethink doing it. Wait — isn’t comparison the way we’re supposed to know how our kids are doing? Though a parent may feel satisfied upon hearing her child’s abilities exceed those of other kids, as it turns out, that kind of data isn’t so helpful after all. Since kids are so different, there is a wide range of what is normal among children. Measuring one kid against another isn’t really fair, because no two are exactly alike. You’ve heard how some kids can read at age 3 and some don’t really start until 9 or 10, right? Another reason comparisons don’t really work is because there are so many other factors that can play into kids’ performance. Since it isn’t possible to control all the other factors (mood, environment, hunger, aptitude, preparation, home life, etc.) comparisons like that just aren’t valid. So, is comparison helpful? And how? Good comparison starts with objective measures. Things we can somewhat control, and that are very similar, too. Comparing last year’s work to this year’s work is a good place to start. That kind of information tells us our children are progressing, and can also tell us the basic rate at which they seem to move. The method isn’t perfect, but it can often tell us our kids are learning, sometimes giving clues for what to add (or nix) the following year. Another good comparison is comparing what our kids can do with what a variety of textbooks, curriculum products or placement tests say they should be able to do. Or thereabouts. Again, not perfect. But, a semi-helpful gauge of where our kids might be, at some given point in time. Trying not to box our children into a set of rules, we can use this kind of data as a general guide, that’s all. A third type of decent comparison comes when we look at how large numbers of other students typically perform in certain grades. That data can be interesting, if only to get an overall understanding of what many children tend to do at that age, but not expecting exactly the same results in our homes. Looking over national averages, regional averages, findings of large research studies, and standardized test results are just some of the places we can turn for approximate measures of where kids tend to be at certain points in time. Let us remember in all cases, however, these are merely approximations of children, not always what we should expect from our own very unique children. When comparison is not helpful, however, is in smaller doses. As in, comparing our kid to another we just met. Or comparing our kid to another child we’ve only heard/read about. Basically, don’t participate in the comparison game. The best small comparisons can do is generate false data, or make someone feel bad for not measuring up. Never a good thing. That’s why comparisons based on chats with parents of children on the playground, children in the youth group, and children in the homeschool co-op isn’t recommended. Those aren’t real samples of children. Why would you compare very different children to your own? Another reason spot comparisons don’t work is because we know nothing about all of the other factors that might explain the differences. We don’t know, for example, the obstacles the other child may be facing. We don’t know the amount of effort the other child is putting in. We have no idea how much parental support the other child receives, the methods used to teach him, the quality of the home environment, the levels of external support the other family receives, or anything. It’s the old apples-to-oranges test. You know where else comparison isn’t useful? In our own families. It’s never fair to compare our kids to one other. Do you have one messy child and one who is very organized? Do you expect the same level of room tidiness from each of them? Why, then, expect them to be identical students? Comparing to “Internet families” isn’t wise, either. While it may be fascinating to read what goes on in other homes (those peek-inside-my-home blogs), remember, blogs written by Internet-families represent just the tiniest look into their lives. There are factors behind those stories we’ll never know. Remember, blogs written by Internet-families represent just the tiniest look into their lives…. While it’s tempting to wonder how our children stack up against other kids, it’s important to remember how harmful it is to make comparisons during the homeschooling years. Nothing tears a parent down faster than believing she’s doing a terrible job or depriving her children. Besides, we all homeschool differently making such comparisons nearly impossible. 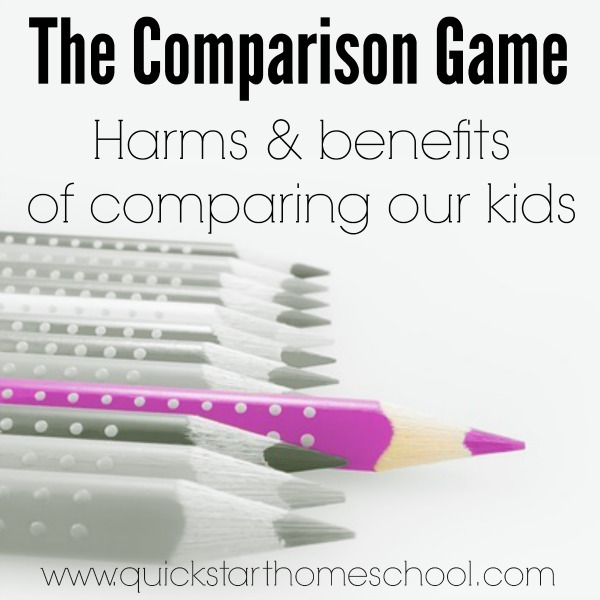 Making improper comparisons on our own, or playing the comparison game with others, can cause great anguish and much self-doubt among homeschool parents. For the sake of your success and happiness, it may be best to avoid comparison altogether. Opportunities to connect with new families are always welcome! Today, I get to meet some awesome new people over at Vibrant Homeschooling! In my guest post, I’m completely transparent about a struggle I faced when my kids were very young. I share how hard days sometimes got to me, but how they also taught me valuable lessons about my kids, our homeschool, and (perhaps most importantly) about myself. It was a rainy morning, the third in three days. And though I dreamt of sipping hot cocoa and playing with the boys in their blanket fort all day, I found myself piling three wriggly uncooperative children into a minivan and heading off to the library instead. My feelings weren’t because I thought the activity would be unpleasant. Actually, I thought it was going to be epic. I knew this, because I had organized the class myself. Not only had I made sure it would be taught by the most knowledgeable person in the state, but I had been careful to specifically request live specimens (not those phony plastic models), periods of learning for every different age group, printed take-home activities and web links, and generally a program I could be proud of. Yet, for some reason, I didn’t want to go. The day was gloomy and the blanket fort was calling. I could just tell my kids weren’t up for another day on the town. Without getting into ugly details, let me just say my instincts were spot on that day. Indeed staying home would have been the better option.